How many moku, or districts, does Hawaiʻi Island have? What are their names? What are some of the different characteristics of the moku on Hawaiʻi Island? What does it mean when ʻAnakala Keoni says the island is growing and expanding? What are some of the unique characteristics of the district where you live? How can you get to know what is kaulana, or famous, on the island where you live? 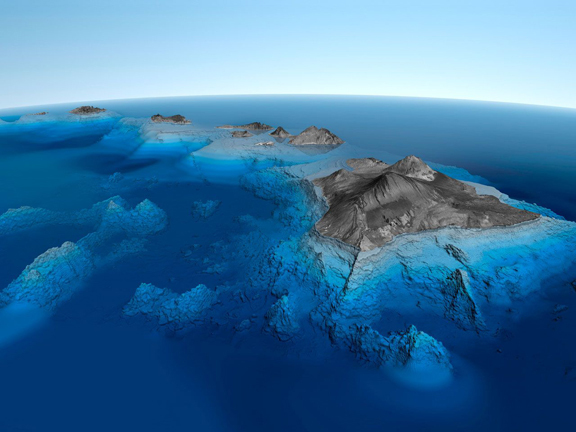 What is the difference between the terms, “Hawaiʻi Island,” “Big Island,” and “Moku o Keawe”? How are these terms used in normal speech? If you could visit any of the moku on Hawaiʻi Island, which would it be? Why? 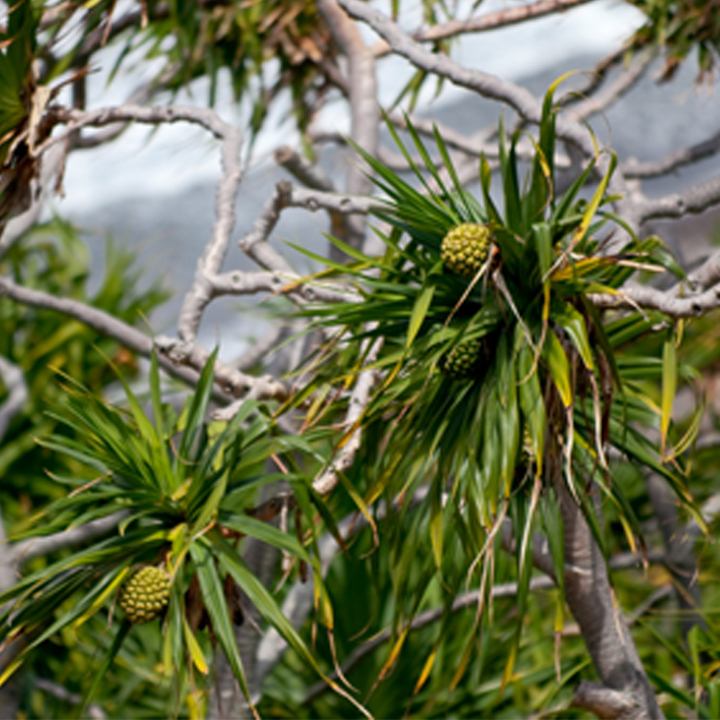 The characteristics described by ʻAnakala Keoni are all part of the island’s natural landscape. Make a list or draw a picture of ten or more special things found in nature that are characteristic of where you live. Here is Hawaiʻi, an island, a man. Hawaiʻi is a man. The land is alive, just as you and kalo and iʻa are all alive. You were born from your parents, who were born from their parents. The following mele speaks of the birth of the land. This is a common feature of mele koʻihonua, creation songs. Listed in the mele above are the names of the islands and the order of birth. Hawaiʻi Island enjoys the privileged position of makahiapo, or the first born of all the island children of Wākea and Papahānaumoku. When we acknowledge the land as a living thing, it reminds us to respect all the things around us and to treat them accordingly. What is Hawaiʻi Island like? Hawaiʻi Island has the most diversity of ecosystems of any island in the chain. There are lowland rainforests in Puna and dry forests high up the slopes of Maunakea and Maunaloa. Countless streams flow through the valleys in Hilo and Hāmākua. And there are the drylands of Kawaihae, South Kohala, and desert-like places in Kaʻū. Each place has its own features and character. There are six moku of Hawaiʻi Island. Moku are large land divisions sometimes called districts. 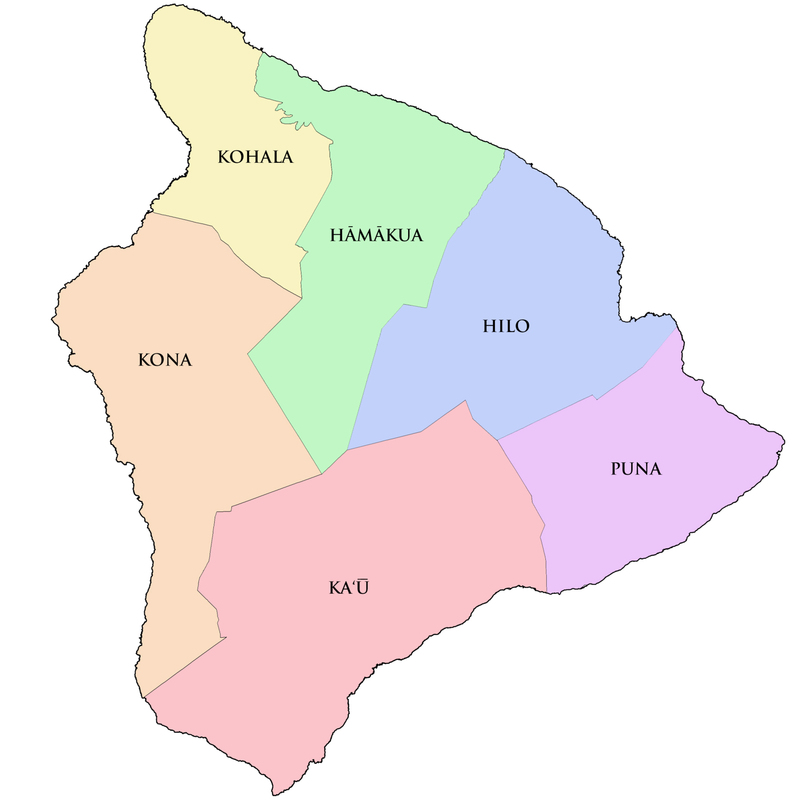 The moku are Hilo, Puna, Kaʻū, Kona, Kohala, and Hāmākua. NAME GAME – What are the names of the moku of Hawaiʻi? Here is a game that tests your knowledge of the moku of Hawaiʻi Island. Each line of the riddle gives a clue to the name of a moku. Can you figure out the clue and match the moku? This riddle hints at the correct answer by using sounds that are part of the moku name. For example, hala (the pandanus tree) hints at Kohala, and makani kona (the south winds) hints at Kona. How well do you know your ‘āina? 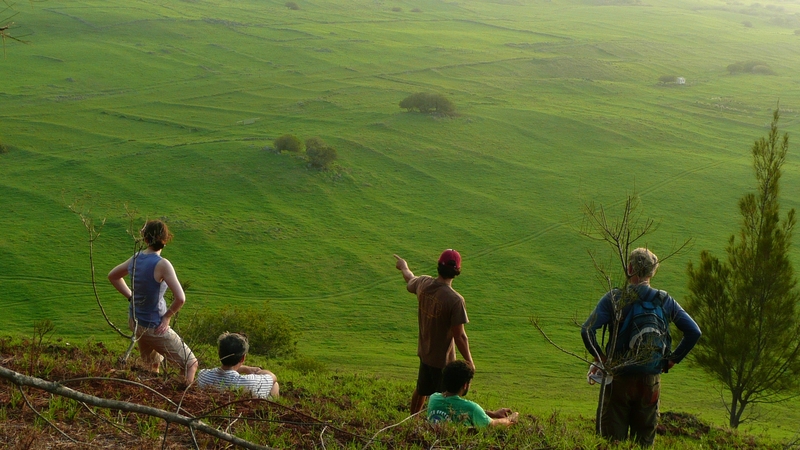 The ʻāina, or landscape, contains wahi pana which are places of historical or cultural importance. Places have stories. Sometimes the story explains why a place has a certain name. Other times, it records an event that took place there. Place names can refer to large areas like the moku of an island. A place name can also be a specific place such as a small hill or a particular ledge of a cliff. Hilo is well known for its rainy climate and its lehua blossoms. There are three parts of Hilo–Hilo Pali Kū, Hilo One, and Hilo Hanakahi. Hilo Pali Kū means “Hilo of the standing cliffs” and refers to the northern part of this moku, where the shore is mainly high, rocky cliffs. Hilo One or “Sandy Hilo,” is a stretch of black sand beach fronting the downtown area. Hilo Hanakahi, named after a great chief of Hilo, is the area south of Kanukuokamanu, where the Wailoa pond meets the ocean. Mokuola, also called Coconut Island, sits in the bay. The Wailuku River flows into the north end of the bay, bringing water down from Waiānuenue Waterfall, the home of Hina and the setting of the battle between her son Māui and the moʻo Kuna. 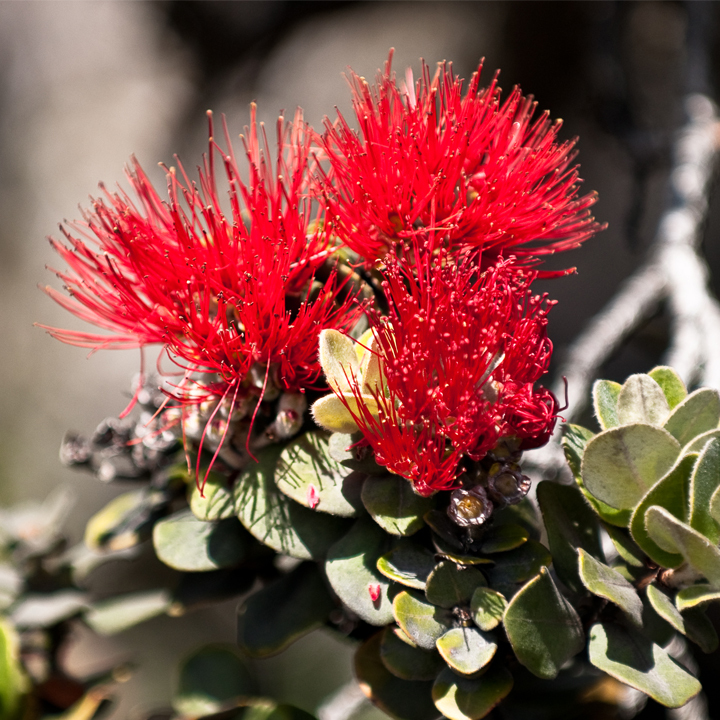 Along the southern boundary, the Panaʻewa Forest once reached all the way to the ocean, and lehua petals would fall into the sea, covering its surface and giving it a reddish appearance. This became known as ke kai kuaʻau lehua o Panaʻewa–the lehua petal sea at Panaʻewa (ʻŌN#1725). The Puna moku is known for its abundant hala. The saying goes, “Puna paia ʻala i ka hala,” meaning the walls of Puna are perfumed with the sweet smell of hala. Along with Kaʻū, Puna is where most of the recent volcanic activity has taken place, a reminder that this is the home of Pele. 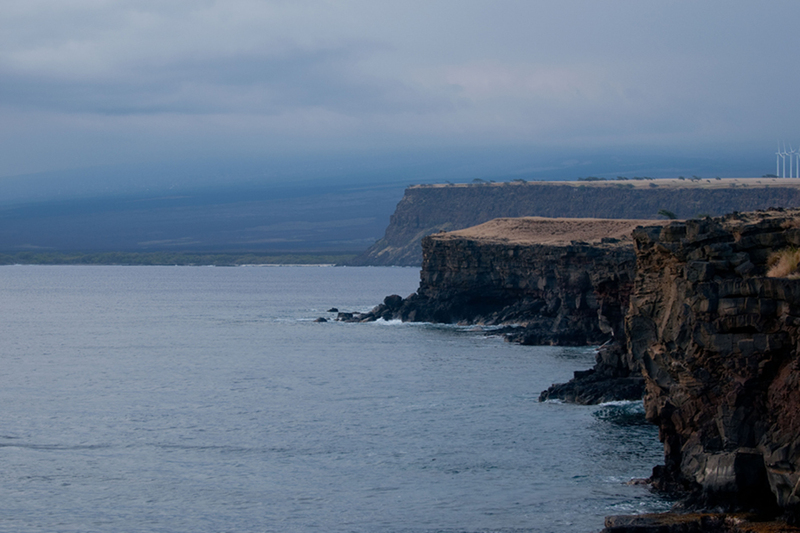 A small bay near the northern boundary of Puna, called Hāʻena, is regarded as the birthplace of hula. Nearby, there is a place called Halaaniani. From the bay of Halaaniani, gifts and other tokens were attached to hala (clusters of pandanus) and set adrift. The ocean current took these things to Kamilo in Ka’ū. Known for its diverse landscape and rich seas, the people of Kaʻū are shaped by their environment. The people are resourceful, and families are close-knit groups. At one time it was said that all of Kaʻū was one family. Another saying mentions the relationship between the people of Kaʻū and the people of Puna, explaining how the people of the two moku relied heavily on each other. Of the many wahi pana in Kaʻū, perhaps Kalae and Punaluʻu are the most famous. Kalae is the southernmost point in the Hawaiian Islands where the two prevailing currents converge, creating great fishing grounds. Not far from Kalae is Palahemo, a brackish water swimming hole. Punaluʻu, a black sand beach, is home to Kauila, a legendary sea turtle and guardian of that place. Kona is on the leeward side of the island. There are three divisions of Kona–Kona ‘Ākau, Kona Waena, and Kona Hema–that is, North, Central, and South Kona. Ka makani ‘Eka, the ‘Eka breeze, helps keep nā Kona cool. Known for ke kai māʻokiʻoki or streaked seas, fishing in Kona is fruitful. Fishing is so much a part of Kona’s identity that the pretty girls of Kona are likened to the kole maka onaona, or yellow eye tang. Many of the historic sites in Kona remain intact. There are house sites, heiau, hōlua sled courses, and fishponds. 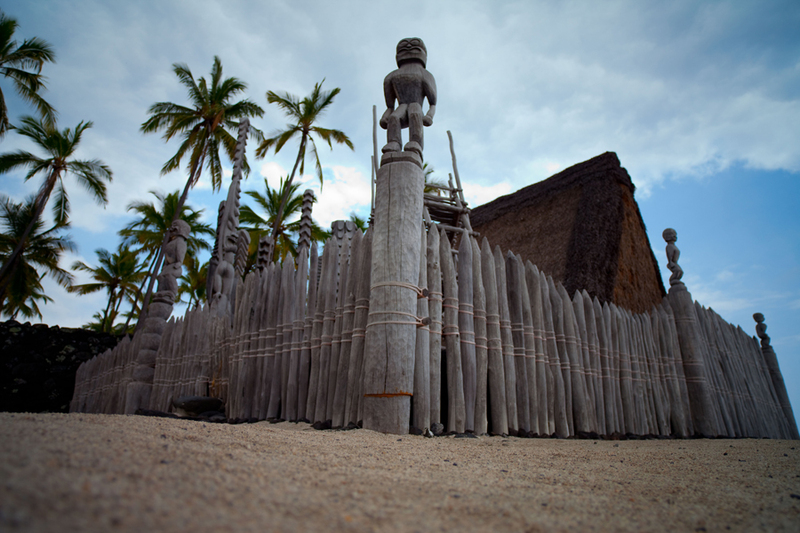 Even the Puʻuhonua o Hōnaunau, the city of refuge, stills stands. The moku of Kohala is probably best known for being the birthplace of Kamehameha I. The people of Kohala are said to be resilient and smart and capable of great works. They are credited with amazing innovations in agriculture, such as the Kohala field system and the wetland loʻi farming of kalo on kula lands which are normally dry. There are valleys on the windward side of this moku and parched seashore areas along its southern boundary. Ka poʻe kahiko further defined the different parts of Kohala by saying, “ʻO Kohala Nui, ʻo Kohala Iki, ʻo Kohala Loko, ʻo Kohala Waho, ʻo Kohala Makani ʻĀpaʻapaʻa, Kohala o Pili me Kalāhikiola, ʻo nā puʻu haele lua.” Large Kohala, little Kohala, inner Kohala, outer Kohala, Kohala of the ‘Āpaʻapa’a wind, and Kohala of Pili and Kalāhikiola, the two companion hills. Hāmākua is known for its tall cliffs along the shoreline. There are few places in the area to land a canoe. 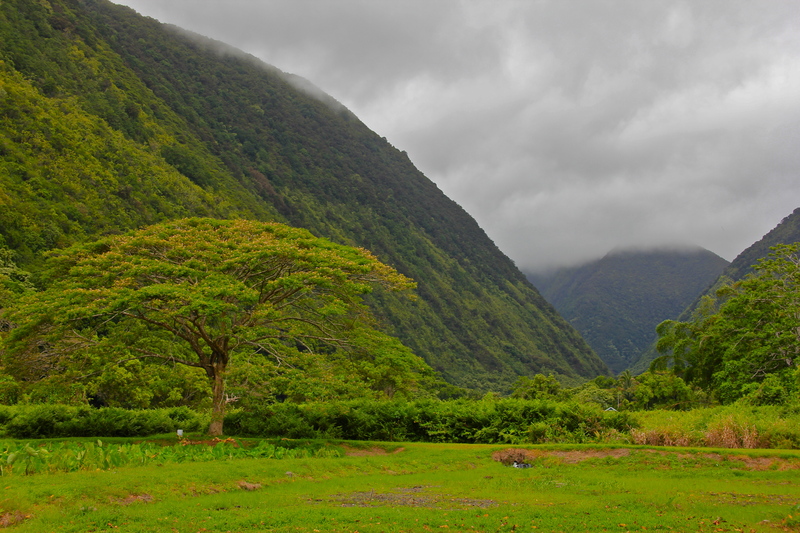 Perhaps the most famous and important spot in Hāmākua is Waipiʻo Valley. 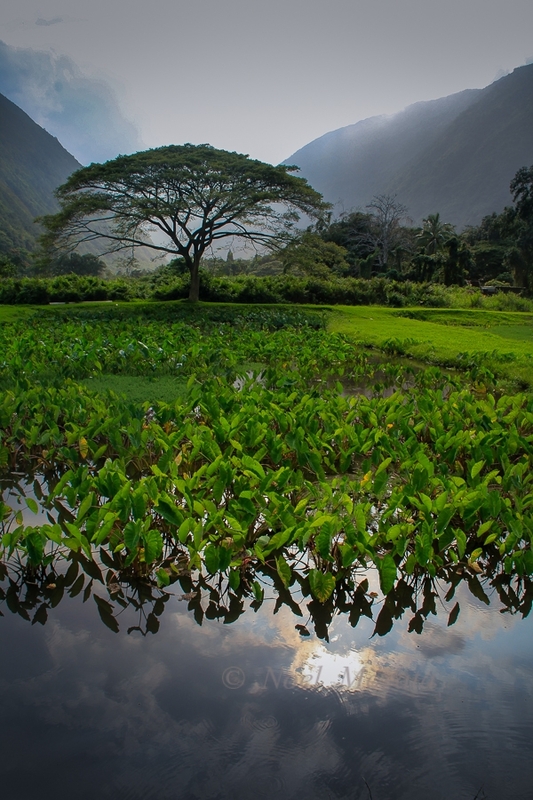 Blessed with an abundant water supply, the valley floor was extensively farmed in loʻi kalo, wetland taro patches. Stories tell us that even in times of famine, Waipiʻo had water, so it always had food. Because of its rich resources and secluded location, the valley became home to the aliʻi ʻai moku of Hawaiʻi Island for several generations. This moku is known as “Hāmākua kihi loa” (ʻŌN#441), or Hāmākua of the long corner. It shares a border with every other moku of Hawaiʻi Island except for Puna. What is special about Hawai‘i Island? Ka poʻe kahiko, our Hawaiian ancestors of long ago, had strong ties to their land. They knew the winds and rains that shaped the land. They knew where to find necessary resources. They understood the systems and cycles of life. They worked hard to create abundance. 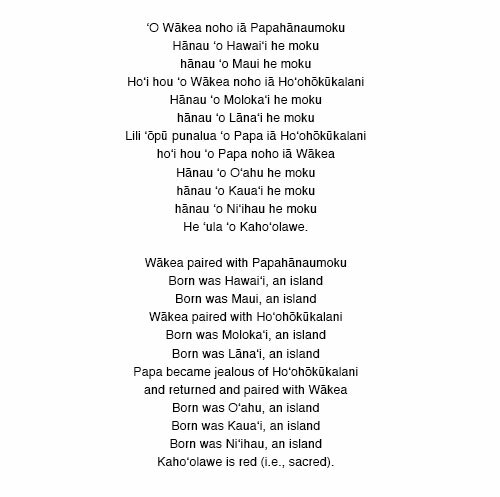 We have many ʻōlelo noʻeau (traditional sayings) and mele that tell us how ka poʻe kahiko felt about the land. In the mele below, we look at aloha ʻāina, native expressions of love for their land. This mele is attributed to Emalia Kaihumua. It describes a trip she took to San Francisco in 1894. After seeing first hand how different this place was, she grew homesick and longed to return to her home. Ke aloha ʻāina kuʻu lei ia. Hawai‘i is by far the best of lands. Love for my homeland is my lei. So what is the connection between kānaka and ‘āina? You have seen different ways in which Hawaiians observe, learn about, understand, and interact with the natural world. This tells us that the connection of kānaka and ʻāina is a living, family relationship. We recognize that the ʻāina is alive and we treat it as such. It is even included in our genealogies as the firstborn children of the gods. We continue our rich traditions of composing mele in honor of the land and recording and remembering our history in place names. We exist and are able to thrive because of all the ʻāina provides us. Beckwith, Martha. Hawaiian Mythology. Honolulu. University of Hawaiʻi Press, 1970. Handy, E.S. C. and Mary Kawena Pukui. 1958. The Polynesian Family System in Kaʻū, Hawaiʻi. Charles E. Tuttle Company. Rutland, VT.
Kamakau, Samuel M. 1976. The Works of the People of Old: Na Hana a ka Poʻe Kahiko. Bishop Museum Press. Honolulu, HI. Malo, David. 1951. Hawaiian Antiquities. Bishop Museum. Honolulu, HI. Pukui, Mary Kawena. 1983. ʻŌlelo Noʻeau: Hawaiian Proverbs and Poetical Sayings. Bishop Museum Press. Honolulu, HI. Pukui, Mary Kawena. 1999. No Nā Kamaliʻi. Mountain Apple Company, Bishop Museum. Kimura, Larry. HWST 461 Pana Hawaiʻi.